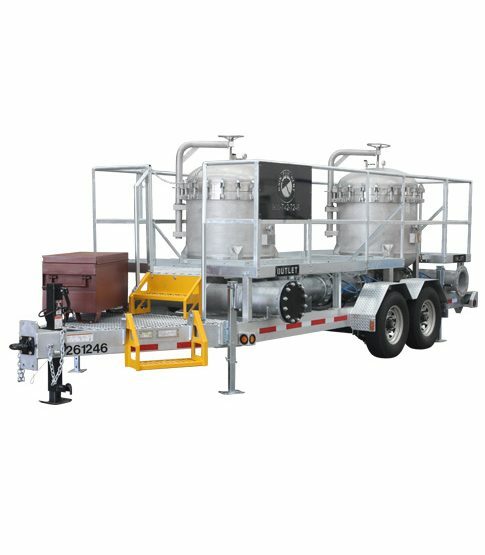 The BF4000 bag filter unit features two bag filter vessels and utilizes sixteen 7” x 30” bag filters in each vessel for superior filtration from 100 to 1 micron for flows up to 4,000 GPM. The filtration vessels can function at 4,000 GPM when used in parallel or two separate 2,000 GPM filtration units in a series configuration using isolation valves. filter bags of a single filter vessel (parallel configuration only). Inlet and outlet on each side of trailer.